The new look resembles WWII army and military campaigns (not quite exactly but just a bit). 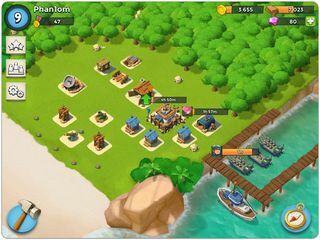 If you are a fan of Clash of Clans, you will probably love Boom Beach just as well. It seems that the peveloper used pretty mch the same concept but introduced a few new things to polish it-up and make it even more fan. Despite quite a different context, you still have your troops to accomplish military campaigns. Yet this time there's no problems with your surviving troops that you probably remember from Clash of Clans. The new look resembles WWII army and military campaigns (not quite exactly but just a bit). If you are successful at your campaigns you get credits for buying more ammor for your troops. You don't just attach but also defend your camp. 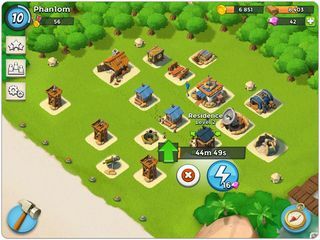 You will have to strategize with your battle ships, troops, resources (gold, wood, stone, iron), and building projects (one project at a time). If you are careful enough you'll be able to get different number of diamonds every day from the treasure chests. At the rate of 11 diamonds/a 1 dollar you get a few bucks worth of premium currency by checking in daily. The game absolutely attractive visually and it offers a lot of challenges for you in its game play.